Like most stir-fry recipes, this one can be altered to your heart's content. I chose a shrimp recipe for all you "won't-eat-meat-on-Friday" Catholic friends of mine. We've also done this recipe with tofu and chicken, and I am guessing that pork and beef would be just as lovely. 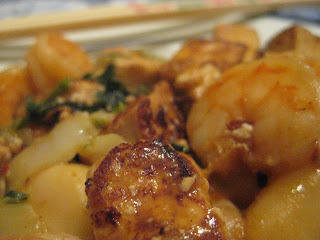 Mix the shrimp (or tofu/meat) with the oyster sauce, cayenne powder, flour and sugar. Let sit for 5 minutes. Heat oil over high heat in a wok or large skillet. Add the garlic, onion, water chesnuts and vegetables to the wok. Cook until the vegetables are tender and starting to brown a bit. Add the shrimp and cook until they turn pink (just 2-3 minutes). Add the water and cook for another 3 minutes. Bring the sauce to a good simmer to thicken a bit and then remove from heat. Serve over rice, squeeze lime on top, if desired. We are not Catholic, but SPH has "given up" something for Lent the last few years and this year I decided to join him. The last time I gave up (rather than my preferred "do something more" approach) for Lent was before kids and I went vegetarian for Lent. It was a piece of cake. I did crave my beloved bacon now and then, but overall, I didn't bat an eyelash. This year could be tough. I have given up chocolate. Chocolate is my thing. I keep frozen chocolate chips in the freezer and rare is the day when I don't eat a handful or two, or three or... But I figured if I really wanted to sacrifice something it would have to be chocolate. Here's the cruel twist: Shannon's older daughter is a girl scout and I ordered a good bit of girl scout cookies, which are due to arrive any day and most of which are, you guessed it, riddled with chocolate. Good thing I know a thing or two about freezing girl scout cookies. They'll taste even better in April, right (if SPH and the boys don't eat them first)? So if I am cranky or ornery here during the next month and a half, you know the reason why...chocolate withdrawal. Anyone else joining me in a little self-limitation? Don't you just hate it when you are *trying* to do your grocery shopping and the cart just won't cooperate? What is your number one grocery store frustration? The boys generally like going grocery shopping (and the samples! ), so mine has to be when I am ready to pay and I realize I forgot something on my list...do I grab the boys and make everyone else in line wait, or do I just forget about it? Decisions, decisions... Unless it is absolutely crucial, I generally just wait until next time. My inner-Julia Child was satisfied this morning by cooking live on WTTE-TV's Good Day Columbus. What a fun experience! Thanks to all of you at Fox 28 for helping me feel so welcome and at ease. Here's the recipe that I cooked on the show. The great thing about cooking this meal is that you decide how to serve each person individually. If you have a little one who doesn't like shrimp, no problem, more for you! If you have someone who really likes sausage, let them plate up some extra andouille. In fact, this recipe works great with chicken or pork too, don't feel like you have to make it only with the sausage or shrimp. As I shared on the show, for this recipe, I have altered a traditional Jambalaya from its usual chunky consistency to a more tomato sauce based presentation. 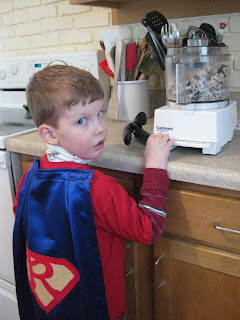 If your child is weary of new foods, get them involved with the cooking, so they have a sense of ownership in the meal. Or, instead of calling it Jambalaya, you could call it Cajun Pasta Sauce...or Mardi Gras Pasta. Cook the pasta according to the instructions. Drain, set aside. While the pasta is cooking, begin to heat the sausage and/or shrimp in a pan over medium heat. Stir occasionally to allow it to slightly brown the sausage. In another saute pan, heat the olive oil over medium high heat. Add the garlic, onion, celery and roasted red pepper. Cook for 4-5 minutes, or until the celery and onion are soft. Add the thyme, oregano, cumin, cayenne, salt and pepper, stirring well to mix. Add the canned crushed tomatoes, worcestershire and hot sauce, if using. Stir well. Cook the tomato mixture for 4-5 more minutes. Serve over the pasta, topping with shrimp and sausage, as desired. Thanks again Fox 28 for a great experience! 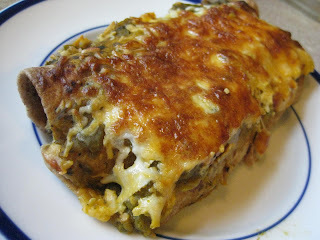 R loves olives, so we call these enchiladas O-live (get it, "I love") Olives and Chicken Enchiladas. We use the leftover chicken from the World's Easiest "Roast" Chicken, making this a cinch to prepare. 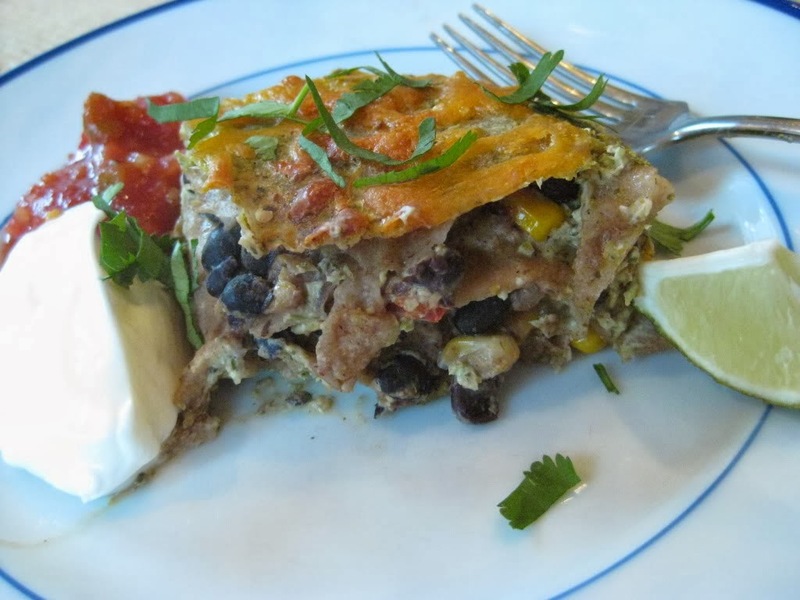 For the filling, the base is light cream cheese, making these enchiladas sublimely creamy, but with much fewer calories and fat than traditional cheese. In a food processor combine the olives, cream cheese, chicken, spices (cumin through oregano) and 1/2 cup shredded cheddar cheese. Pulse until well combined. Place about 1/2 of the mixture on a tortilla. Roll the tortilla and place in a 9x13 baking dish, seam side down. Repeat. Cover the Enchiladas fully with the salsa verde. Bake for 20-25 minutes, or until the edges of the tortillas begin to brown. Top with remaining 1 1/2 cups of shredded cheddar cheese. Place under broiler for 2-3 minutes, or until the cheese is bubbly. I recalled last week one of my lost slow cooker recipes from years ago. When I found it I felt as though I had uncovered a lost treasure, since this recipe so easy, you can hardly call it cooking. It requires almost no effort, is foolproof and the results are tasty and healthy. Excited? 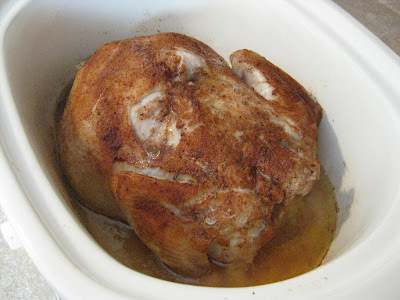 It is Slow Cooker "Roast" Chicken, and the recipe couldn't be easier. 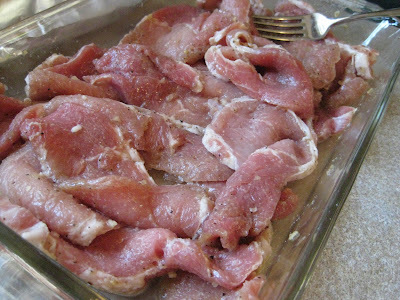 Remove any innards from the chicken (usually the organs (yuck!) are inside the cavity of the whole chicken). Place in the slow cooker. Rub the chicken all over with the seasoning mix. Cook on low for 8-10 hours. As the chicken cooks, the fat melts and bastes the chicken. See all the liquid in the bottom of the slow cooker? That is just from the juices percolating inside the chicken. I didn't add a drop of liquid to the pan. The chicken is so moist, you won't believe it. We had enough leftover chicken after we ate it for dinner, we made chicken enchiladas the next night. Two meals out of one inexpensive chicken. Love it! Here's my weekend recap: SPH came home Friday from a short work trip with a huge bouquet of tulips in hand. This not only was a great surprise ("bringing you flowers on Valentine's *Day* would have been too predictable"), but it also helps remind me that spring is just around the corner...tulips are my favorite flower and I have smiled each time I pass them on the dining room table. After open gym at Wendy's on Friday, SPH and I headed out for a great meal at Z Cucina. Saturday SPH let me sleep in, brought me homemade pancakes for breakfast in bed and then said to me, " why don't you take the day off?" I shopped, met my good friend Erin for lunch at Panera and then shopped some more. Needless to say, SPH scored major, major points. The other big news of the weekend is that R learned to ride his bike with no training wheels! It was completely out of the blue when he asked SPH to take his training wheels off his bike. 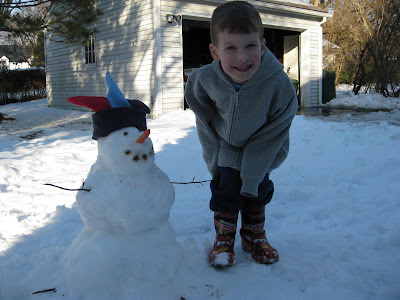 I was inside getting G ready to come out and by the time we were bundled up, R was riding a good 10-20 feet without help. I am so proud of you R! 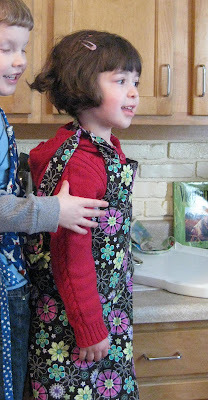 Bonus: While winter is cold, the extra layers provide good padding for someone trying to learn this new skill. 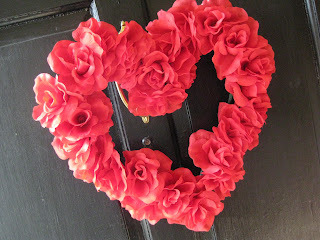 I am really getting ancy for spring, but I realized yesterday that we are already half-way through February and getting closer to March each day! A friend who has a school age daughter lamented to me the other day about Lunchables. Sure, they're easy to pack, but they are, how shall I say this, not the most nutritious option for lunchtime. Not two days later I was sent some Go Picnic MightyMunch Kid Meals. Ironic, don't you think? Go Picnic markets a full line of ready-made boxed meals, all of which are free of MSG, High Fructose Corn Syrup and Trans-fats. In fact, the Kids Meals we sampled were made up of largely organic and/or natural products, with many gluten free and kosher options available. Here's my take: As an alternative to Lunchables, these win hands' down. Will I stop making lunches every time R stays for Lunch Bunch? Probably not. But for a quick emergency no-pack lunch, these are fun, cool (R's comment) and a novel approach to pre-packed meals. On one hand, I am thrilled that the Beaba Babycook may encourage some otherwise-not-willing moms to make homemade babyfood. On the other hand, my steamer insert in a plain ole' pan and food processor did just fine for making all our homemade babyfood and I didn't have to have a new piece of equipment taking up space in my cabinet, nor did I have to pay an extra $150. But does that sound old and crotchety? Anyone out there tried the Babycook? There are certain class recipes that i feel every cook should have in their repetoire. A good chili recipe, for one...check. A nice meatloaf wouldn't hurt...check. A go-to roast chicken recipe and an amazing lasagna creation...check, check. One thing I had been lacking was a solid beef stew recipe. For months, no years, I felt like something was missing, that I didn't have a full recipe box without my standby beef stew recipe. This is an outside-the-box beef stew that was inspired by several good restaurant stews (including the most recent mushroom stew at Black Creek Bistro) and various other recipes. I think the trick for me was to shatter the notion that beef stew had to have potatoes, carrots and the traditional fare. If you are a vegetarian, this is just as delicious with all mushrooms replacing the beef. In a saute pan, heat the oil over high heat. Mix the beef, flour, salt and pepper, mixing well to fully coat the beef. Sear the beef over high heat for about 5-6 minutes, stirring once or twice to ensure adequate browning over all the beef. Deglaze the pan by pouring red wine or 1 cup beef broth and scraping the bottom of the pan to loosen all the good browned bits. Pour the contents of the pan into your slow cooker. Add mushrooms, rosemary, thyme, onion, garlic, tomato paste and additional beef broth to the slow cooker. Add the butternut squash*. Cook on low for 8-10 hours. #The stew can be made even more rich and thick by taking a couple ladle fulls of the broth out of the slow cooker, mixing in a tablespoon or two of cornstarch, and bring the mixture to a boil on the stove top and simmering for a minute or two. Then add the broth mixture back the slow cooker and mix. *I had the best results by adding the squash about halfway through the cooking, so it wasn't too mushy. But you can add at the beginning too, if you wish. We're on an oatmeal kick again. The boys are eating copious amounts of oatmeal each morning, but I can't complain. Whole oats, fruit and ground flax seed make a good, solid, budget-friendly breakfast. Trouble was, mixing up the concoction for their breakfast each morning was time consuming and sometimes just down right annoying when R and G are hungry and wanted their food ready 10 minutes ago. 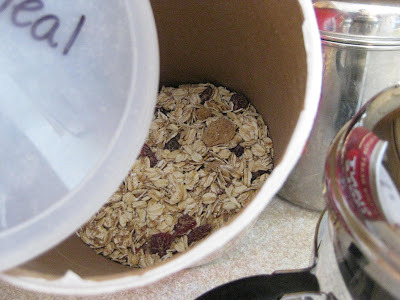 I used a soon-to-be-empty oatmeal bin and mixed up a huge vat of oatmeal mix (using the basic Election Morning Oatmeal recipe). I basically mix the oats, cinnamon, brown sugar and add ground flax seed, nutmeg, allspice and any dried fruit I have on hand. Voila! Oatmeal mix ready to be scooped out and microwaved before the boys can utter their first whine. 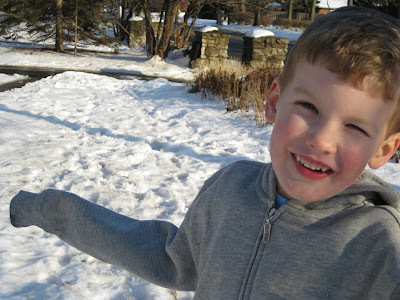 No, not a toddler meltdown...our snow and ice. 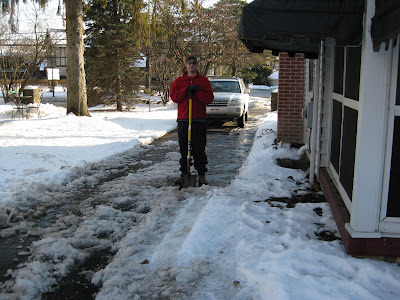 The sound of snow melting is everywhere and I have been caught off guard by more than one sheet of ice whooshing off a neighbor's roof while outside this weekend. 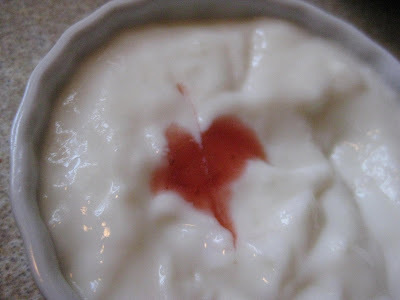 We had fun creating our Valentine's Day pudding, even if J said, "it tastes like dirt!" I blame the year-old heart sprinkles that she and R dumped on their pudding in huge mounds. R, in classic boy form said, "it may taste like dirt, but this dirt tastes gooooood!" 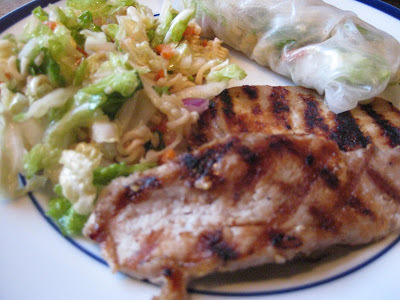 Hanoi Pork with Cabbage Salad Summer Rolls? We ate Hanoi Pork this Monday and the kids *loved* it. 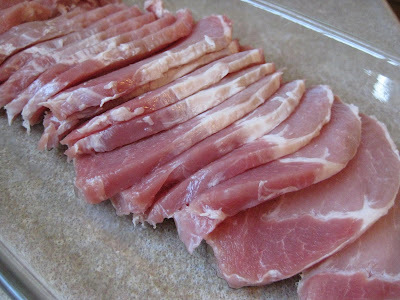 I was thrilled because Hanoi Pork is one of my all time favorite recipes. It is also super easy and quick too. Mix the marinade and brush it over the pork. Let it sit for several hours, turning the pork once if possible. On a hot grill pan or grill, grill for about 3-4 minutes per side. Serve with Napa Asian Slaw and Rice Vermicelli Noodles. We wrapped the Napa Asian Slaw inside of Summer Rolls, and it was fabulous. Enjoy! What's been your reaction to the peanut butter/salmonella situation? Personally, we are still using peanut butter...just not PB products. But I realized I may be in the minority? Need a little lighter fare after the weekend Super Bowl? This salad is one of my rare posts on a recipe that really isn't kid friendly, but it is so divine, I had to share. But first, a story: this recipe is based on a dish I tasted when SPH and I were in San Fransisco a few years ago. I ate it at this sweet little Italian restaurant that, for the life of me, I cannot remember its name. It was so simple, so fresh and flavorful. Every time I eat this salad, I recall a leisurely, wonderful dinner sans kids. Ahh...it is a nice memory. 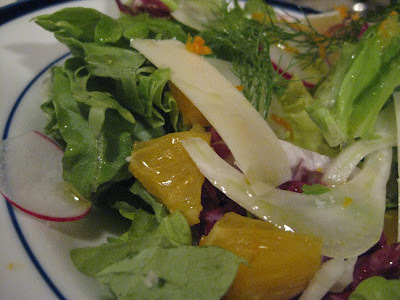 Place the lettuce, radichio, oranges, fennel, radishes (if using) and parmesan in a big bowl, tossing well to mix. Mix the dressing in a separate bowl, then toss the salad with the dressing. Take a few of the fennel fronds (whispy top portion of the fennel) and chop them and sprinkly on top. Serves 6-8 for an appetizer, 3-4 for a main dish. *never tasted fennel? It has a hint of a black licorice to its taste. But don't worry, I can't stand black licorice, but love this salad. Of course we watched the Super Bowl last night. Isn't it nice to have a major football event/bowl that doesn't start at 8pm? The boys were thrilled to be able to watch some of the game. I even whipped up some of my Golden Chili with Carmelized Onions and Sausage, making a double batch to stow in the freezer. It simmered all day long, filling our house with the best smell. We also had our fair share of snacks, so this week it is back to healthy eating! All new recipes, all to share with you if they pass muster. 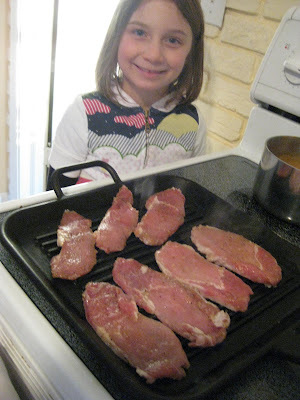 Actually, I have made the pork and chicken before, I am just tweaking the recipes a bit and will pass them on to you.